This remake of the ever-popular KA-BAR Mark 1 knife features a handle made from Kraton G, an extremely durable polymer that also resists water, sweat and chemicals. It preserves the original handle shape to provide a secure a comfortable grip. The knife comes with the classic large clip point fixed blade, capable of delivering powerful chopping and piercing strikes in self-defense scenarios. Its size and strength also make it an effective and versatile utility knife. Over the high-quality steel, a black epoxy powder coating provides protection against wear and also prevents reflections, making a stealthy approach easier. 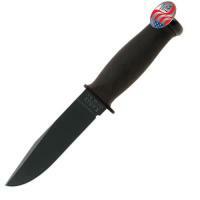 The KA-BAR comes with a protective hard plastic sheath, with MOLLE-compatible straps for portability.